Miniature carriage units with cylindrical roller flat cages are corrosion-resistant, ready-to-fit cage guidance systems for limited stroke lengths. They have a high load-carrying capacity, high rigidity and high accuracy while requiring very little space. Due to their compact design, they can often be used to replace guidance systems that require significantly more space. The units are produced in numerous carriage and guideway lengths, giving cost-effective designs. Miniature carriage units are linear locating bearings. They support forces from all directions ─ apart from the direction of movement ─ and moments about all axes, are more rigid than linear recirculating ball bearing and guideway assemblies and have exceptional smoothness and running accuracy. The units are particularly suitable for short stroke lengths, low-friction and oscillating motion and high loads with very high rigidity. Preferred applications are in the medical sector, electrical industry, robotics and laboratory equipment as well as applications involving clean room conditions. 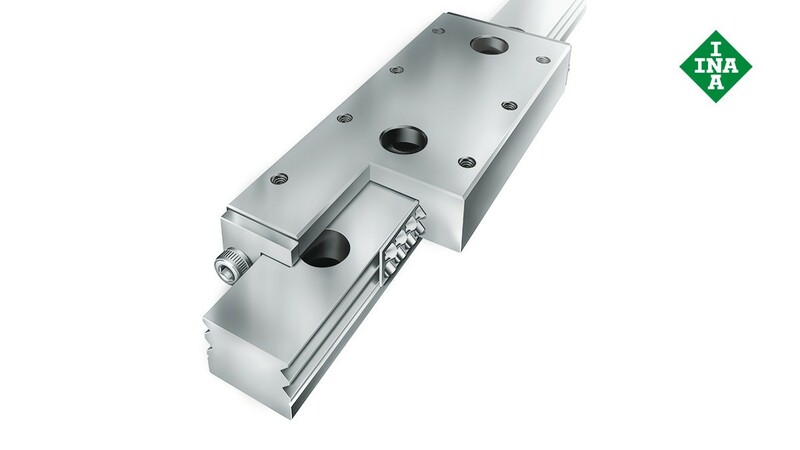 Miniature linear guidance sets with cylindrical roller flat cages are corrosion-resistant, ready-to-fit locating bearings for limited stroke lengths and are preloaded during fitting. These linear guidance systems have high load-carrying capacity, high rigidity and high accuracy while requiring very little space. Since the layout of the guidance system can be varied, the elements can be easily matched to predetermined adjacent constructions. The sets are delivered in many different application-specific lengths. The sets are particularly suitable for short stroke lengths, low-friction and oscillating motion and high loads with very high rigidity.